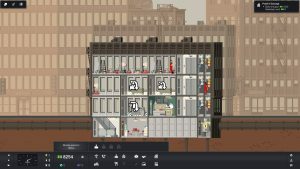 Project Highrise is, in several ways, the fulfillment of a dream. If, like me, you’ve been waiting years for a true successor to Sim Tower and Yoot Tower, having a spiritual sequel is a dream come true; and if you’re SomaSim, the game’s development studio, it’s the game you literally founded your studio to make. But conceptual questions, important as they may be, don’t tell us whether that dream has been fulfilled with the grace and conviction we might have hoped for. Things certainly seem right up front: there’s a streamlined, functional interface, an attractive (if simple) presentation, and a pleasing atmosphere, all layered over what appears to be substantive gameplay. So the question isn’t so much whether Project Highrise can convince us to willingly sign the lease, but whether the appearance of luxury is providing cover for a slumlord. 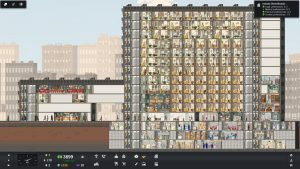 Like the tower simulations that came before it, Project Highrise is all about building and managing a big, beautiful downtown skyscraper. Build up your architectural wonder, decide what establishments or apartments to populate it with, then fill those rooms and keep your tenants happy by providing them with the right services for the right price. Do well, and you’ll make enough money to continue building your vertical empire. Do poorly, and you’ll go bankrupt or find yourself having to make hard decisions about the best ways to move forward. While the game doesn’t have an overabundance of different modes, what it does have is still substantial. A sandbox-style tower can be played at will from the start, but the game also has ten pre-made scenarios, each with three goals to complete. These scenarios don’t entirely tutorialize the game (which is done through unobtrusive popup windows as things progress), but they do act as good introductions to solving certain problems. Fulfilling the individual goal requirements earns you medals, and while these provide no particular reward other than the feeling of a job well done, they’re a nice tactile way to measure the gradual improvement of your skills. These scenarios are a worthwhile addition to the overall package. The gameplay has sufficient depth to sustain itself for dozens of hours all alone, but having individual problems to figure out the most efficient way of solving adds a little thoughtful complexity to what can otherwise be a fairly standard formula. Of course, “standard” is a relative term, and it takes a good chunk of time before players will be familiar enough with the various systems to feel as though they’ve mastered them. 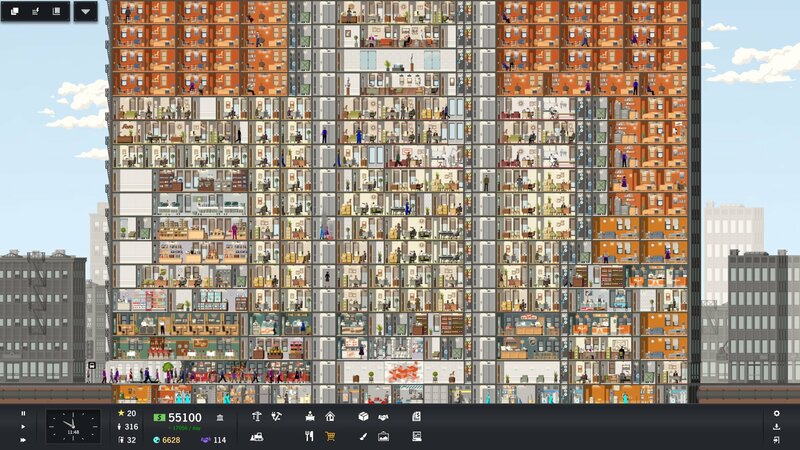 Unlike Sim Tower, SomaSim went out of their way to ensure that Project Highrise isn’t a total cakewalk. Failure and setbacks are both definite possibilities, either through overextending a building project when you’ve already taken out too many loans, completing a major project without having set up the proper infrastructure beforehand, or not having the funds to deal with unexpected problems that could cause tenants to vacate your building. A wide variety of different units are available to rent. The list starts with small offices and stores, studio apartments, and coffee shops, and ends with corporate headquarters, multi-level luxury loft apartments, and prestigious restaurants and stores. Each of these rental units will have different needs, such as being on higher or lower floors, having phone, gas, or cable TV service, or being in areas free from offending smells or noises. This means that layout is important. If you place a restaurant next to some basic studio apartments or tiny offices, nobody will care, but if you place a luxury apartment next to a pizza joint, don’t expect that apartment to remain rented for long. This leads to a constant push and pull between your different tenants, but it’s much more about planning than micromanagement. Once you’ve set up a good floor plan and provided the necessary services, you won’t have to constantly check to make sure everyone is happy. A good plan will largely sustain itself. 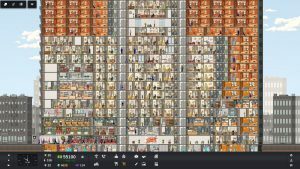 The gradual swell of services and infrastructure will open up new types of units for you to rent, and it’s easy to create concrete goals for your tower since many of these will have specific requirements before they’ll move in. Certain business types require others to be present, such as larger offices requiring a variety of decent places to eat, or medical offices requiring a drugstore, where others will simply want the required services to be in place (such as courier services or a temporary staffing office) to keep them from moving out. It’s a good loop: a gradual increase in tenants leads to new funds, new funds lead to new plans, and new plans must then be carefully implemented so they lead to more tenants and more funds. Whether you’re playing a scenario or the sandbox mode, this loop is always satisfying. 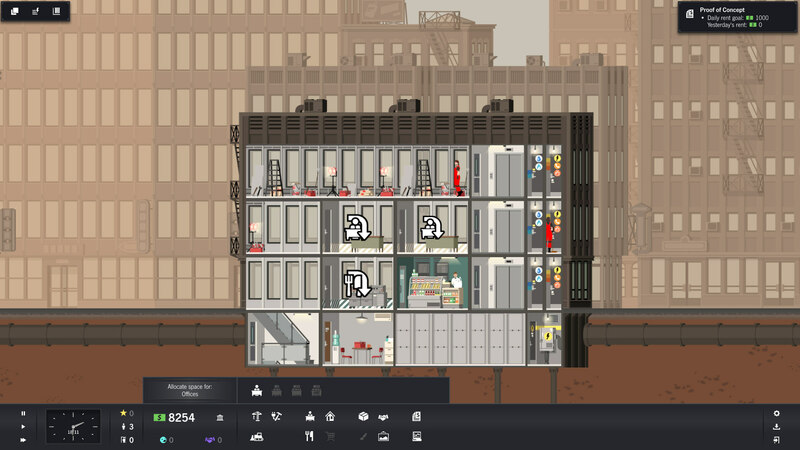 Project Highrise also pleases with its excellent presentation. Graphics are simple and attractive, and read very well at a distance, which is important for later stages of gameplay when towers get gigantic. Things don’t fare quite as well when zoomed in, as the 2D images look just a little blurry at the highest zoom, and their animations aren’t especially articulate, but this isn’t much of an issue since 99% of the game is played from a greater distance. Despite their simplicity, characters and environments have a surprising amount of style. Characters somewhat lack personality, but will still wander to and from their homes and jobs, stopping at shops and restaurants along the way, which is good enough to fill your tower with a sense of life. Workers are also smartly colored to help quickly identify what’s being constructed, renovated, or cleaned. Music is quite limited, but is also perfectly suited to the game’s atmosphere. It’s pleasant and ignorable in just the ways it should be for a game of this type. In the end, Project Highrise is a worthy successor to the games that inspired it, and it surpasses them in almost every conceivable regard. 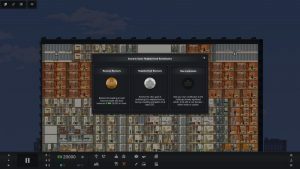 It’s not a perfect game, and there are occasional informational and interface deficiencies that will frustrate, but on the whole, SomaSim has created a home run from start to finish. This is a labor of love no simulation strategy fan will want to miss.